A pioneering project has been launched in Orkney to create a "green" electricity grid mixing renewable energy with battery technology. The "smart energy" scheme will use domestic batteries and electric vehicles to "balance" the local power network by meeting supply with demand. It is being backed by £14.3m of UK government funding. The aim is electricity from renewables which does not rely on fossil fuels when turbines are not turning. 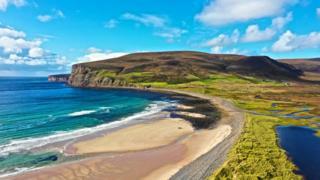 Orkney has been chosen because of its high take-up of "micro-generation". Official figures show that 10% of homes create their own electricity - compared with a UK average of 2.8%. It has 2kW of renewable energy capacity per property which is 900% more than the UK average. The county also has almost four times more electric vehicles per home. UK Energy Minister Claire Perry said: "What we are seeing here on Orkney is a test bed for the energy system of the future. "These smart systems are a key part of our modern Industrial Strategy and will provide cheaper, greener and more flexible access to energy for everyone. "What we learn from these innovations could one day be rolled out across the UK and exported around the world and we'll be able to say it was 'Made in Orkney'." The £28.5m project will create a "smart energy group of islands" where software balances local supply, storage and demand. It should make electricity cheaper and eventually remove the need for fossil fuels. Small batteries will be offered to homes with existing wind and solar technology while larger ones will be installed at businesses and public buildings. Gareth Davies from Stromness-based renewable energy consultants Aquatera, told BBC Scotland: "A key part of this project is to start building in local resilience and capacity within our local energy system. "To date we've relied on UK systems to provide that balancing service. This project is all about delivering that service locally." Existing infrastructure in renewable energy is capable of generating 130% of Orkney's annual electricity demands. With a steady increase in drivers switching to electric vehicles (EVs), that growth is expected to increase the demand on the energy grid. But because cars are only used for a relatively small part of each day, the batteries in EVs can be used as an energy source when electricity demand is high. Adele Lidderdale, from Orkney Islands Council, said: "Electric vehicles are a really important part of this project. "At the moment, 2% of vehicles in Orkney are EVs and we're looking to take that up to 10%. "In Scotland they've made commitments to reduce fossil fuel vehicles and by 2032 we really need to be seeing a lot more electric vehicles on the road." Neil Kermode, managing director of the European Marine Energy Centre (EMEC), added: "We think this really significant, not just for Orkney but for the UK as a whole. "We know we're going to use renewables to power the system, we've got to find out how to do it. "This is a way that unlocks the complicated process of using renewables for heat and transport as well as electricity."